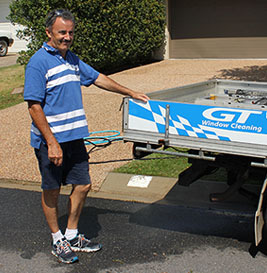 Are you familiar with all the different methods used by window cleaners in Caloundra? Because not all methods provide the same outcome, we’ve listed some of the common ones for you, as well as the pro’s and con’s of each. In most situations, using a handheld squeegee will provide superior results because it’s such an effective way to remove all surface dirt. Because the window cleaner is up close to the window, it’s easy to see if there are bird droppings, paint splatter, or other hard to remove matter on the window. When this happens it’s easy to use a glass scraper or other non-scratching pad to remove the matter before washing the area again, resulting in a beautiful clean. Edges can be cleaned with chamois or cloths to remove soapy water left behind, and window tracks and sills can also be wiped by hand to remove any dirty residue, and stop any further drips. This is the method you can see being used in the gallery on our Window Cleaning page. Using a squeegee can sometimes leave lines that need to be wiped away, but this is something a reputable and experienced window cleaner will have no problem managing. Partly because of this, the squeegee window cleaning method does require some skill to be done well and done quickly. However the main disadvantage to this method is the need for easy direct access. This method isn’t suitable if the window can’t be safely reached by ladder, most often the case when there is no stable even ground to sit the ladder on. A water fed pole is soft bristle brush on the end of a very long extendable pole that has a hose inside. Windows are cleaned with the brush on the end of the pole, while the water is used to loosen and rinse off any dirt. Because there is no need for a ladder, the pole can be used by a person standing on uneven ground. This method can also be much faster because there is no need to keep climbing up and down a ladder to reposition it. Not as good at removing anything stuck firmly to the glass, because no hand held scraper or ‘elbow grease’ can be used. Also, because this method relies on a constant stream of water coming from the brush, areas underneath the windows become very wet. We never use this method, however some window cleaners might because it is very powerful and very fast. The high pressure may cause water to get through window seals and window sills, and cause a mess inside the premises, or possibly even damage.